Have you dreamed of traveling to Paris to build the Eiffel Tower? In a game of time and resource management in a typically Parisian setting, you can experience this Dantesque construction site from a fun, aerial view. 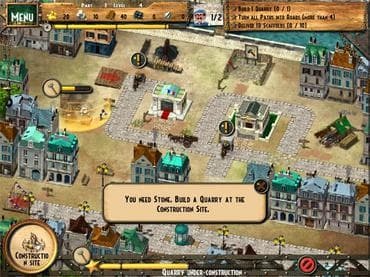 You can travel through the streets of 19th century Paris and visit the super construction site of the famous Eiffel Tower: improve each strategic neighborhood for the world expo, provide strategic parts necessary to supply the construction site, develop the local economy, improve the roads so it's easier to transport materials! During the 50 levels of the scenario-based game, you will manage the construction crew that you employ and train yourself and the fleet of transportation trolleys and vehicles. But be careful! You'll have to manage the workers when they go on strike, keep your construction site safe from burglars and negotiate with local and foreign merchants to get the job done! Only the quickest will uncover the gold at each level! Free Game features: - Manage Eiffel TowerTM construction site from 1886 to 1889; - Make the better use of your workers; - Influence the world with a famous monument; - Enhance your historical knowledge around Eiffel Tower. If you have questions about Monument Builder Eiffel Tower game, please contact us using this form.